There are foods that we inevitably associate with certain people. If anyone mentions pasta with ragù, for example, I always think of my son, George, who must be one of the world’s leading experts on the dish by now, considering his vast hands-on experience in the field. And lemon meringue pie always brings to mind my sister. I’m not even sure why, although it might just be because her lemon meringue pie is so damn good. And when I see this week’s dish on a menu, I can’t help but remember my old friend Nigel. I miss many things about him, but his penchant for spraying me with a sauce based on cuttlefish ink and olive oil is strangely not one of them. I mean, just look at the photo. Most people wouldn’t want to smear that over their freshly laundered clothes. Most people I know wouldn’t want to put it in their mouths, for that matter. Each time Nigel decided to order pasta with black sauce, it seemed to be the result of some kind of perverse, yet highly predictable logic, inexplicably linked to the colour of my shirt: if it was white, he’d order it. It became so predictable, in fact, that I even began to wonder if he was doing it on purpose. Because every time I put on a white shirt, it was the same story. “What shall I have today? Mmm, think I’ll go for the spaghetti al nero”. Half an hour later, he’d look like The Joker after a frantic black lipstick session, and my shirt would look like a Jackson Pollock from his monochrome period. A clumsy Englishman twirling spaghetti covered in what to all appearances is crude oil, within range of a white shirt, is an accident waiting to happen. Although the crude oil comparison is a touch misleading. I mean you could probably call out Greenpeace or somebody and they’d have a wizard product to help you tackle a tanker-size oil spill. But cuttlefish ink? No way. This is why it was used in ancient times as a dye. Because it doesn’t bloody well come out. 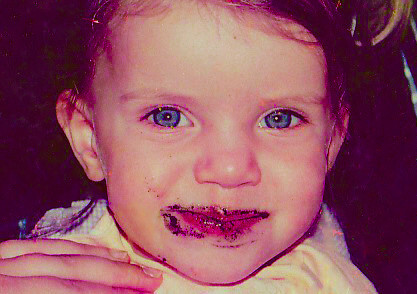 For an idea of what it does to anything it comes into contact with, have a look at this photo of my daughter after only a couple of forkfuls of the stuff. Imagine what she was like by the time she’d polished off the whole plate. It took us three weeks to get her clean. Anyway, appearances aside, it’s actually very good. I’ll be honest, part of its charm comes from the fact it’s so unearthly. You get a kind of perverse pleasure from eating something that quite clearly shouldn’t be offered for human consumption. It’s the sort of dish you might like to order when tourists are sitting at the next table, just to watch them look on in horror as you dig in, your lips, tongue and teeth turning deep black. My particular recipe, like many things I cook, has a Messinese twist to it, in this case in the shape of ghiotta ingredients. Elsewhere, things are kept simpler, with a soffritto based on just garlic and parsley. And the orange zest is an inspired addition I first tasted at the Bellavista restaurant in Messina. The fresh zesty taste not only provides interesting contrast on the palate, but also a touch of welcome colour to a dish that otherwise has something of the oil slick about it. Slice the cuttlefish body in half lengthways and then crossways into thin strips. Chop the tentacles into short sections. Heat a little oil in a large frying pan and gently fry the soffritto ingredients until the onion is soft (about 10 minutes). Turn up the heat and add the sliced cuttlefish and stir-fry for a couple of minutes. Add the wine or brandy and cook for a few minutes more, stirring all the while. Add the tomatoes and cook until the sauce starts to thicken (about 10 minutes). Stir in the cuttlefish ink, add a ladleful of hot water and then cook, covered, over a low heat for 30 minutes, stirring occasionally. Add pepper and/or chilli to taste. You shouldn’t need any salt, due to the capers and olives, but taste it and see for yourself. While the sauce is simmering, heat a large pan of salted water and start to cook your pasta, judging your cooking times to make sure the sauce will be ready first. Drain the pasta when it’s al dente and mix with the black sauce. Sprinkle over some grated orange zest and serve. 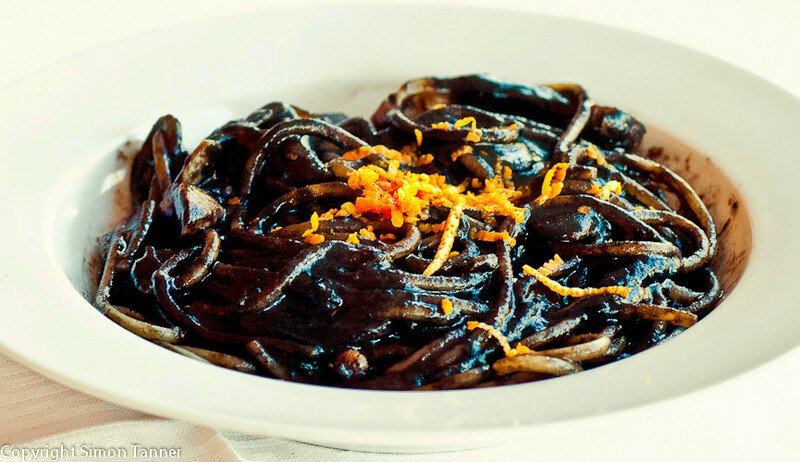 This entry was posted in Fish, Pasta, Recipes and tagged cuttlefish, fish, pasta, sugo al nero by hungryenglishman. Bookmark the permalink.